How do I end up with fabulously moist turkeys every year for Thanksgiving and Christmas? By cooking them exactly the opposite of the way recommended by the helpful home economists at 1-800-BUTTERBALL. At least they don't recommend stuffing the bird — I agree with that for retaining moisture. 😉 But from there, we differ. I cook my turkey breast side down, in a bath of chicken stock, so the breast meat bastes itself in its own juices while baking. I also keep the roaster pan covered almost the entire baking time to allow steam to circulate. This keeps the entire turkey moist — not just the part bathed in stock! About a week prior to cooking my heritage turkey, I cook 2 chickens in order to make chicken stock. Check out my instructions for cooking chickens in crockpot here. Once chickens are cooked, let cool and debone. Set aside bones. In a big pasta insert pot (mine is 11 quarts), combine chicken bones, apple cider vinegar, ginger root, bay leaves, onion, and pepper. Nest insert pot inside pasta pot. Fill with water to within 3 or 4 inches of the top. Then, bring to a boil on the stovetop. Once boiling, reduce to a simmer, covered, for at least 1/2 a day. After simmering step, remove from heat and pull out pasta insert pot. Let it drip well before transferring it to a big bowl or the sink to catch the remaining drippings. Finally, salt finished stock to taste and let cool. If you don't have time to cook chickens, perhaps you have some bones tucked away in the freezer than you can turn into stock. Or, use purchased stock from free-range, organic chickens (or turkey). If desired, brine your turkey several days before you plan to bake it. When ready to bake, preheat oven to 425 degrees Fahrenheit. 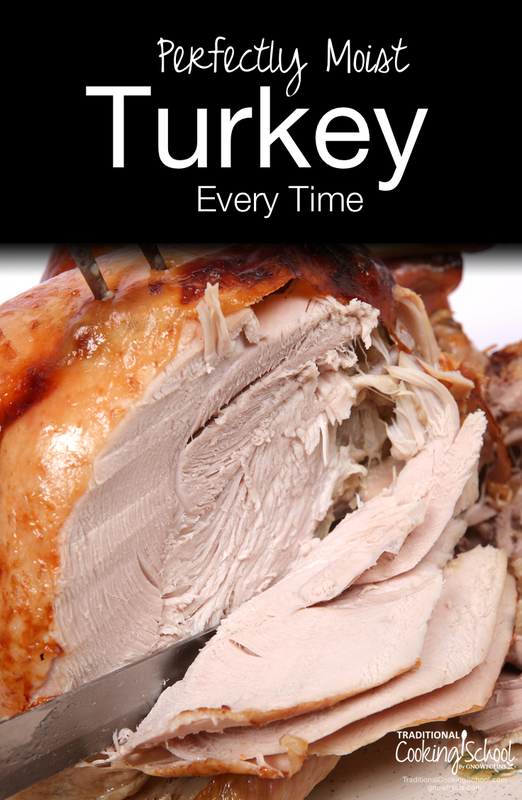 Rinse the fully-thawed or fresh turkey. Empty the inner cavity. Place bird, breast side down, in a stainless steel roaster pan, preferably on a shallow rack. Add stock, or stock + water to the bottom of the pan. Generously brush all exposed skin with oil. Put the cover on the roaster pan, then transfer to oven. Bake for 1 hour. After 1 hour, lower temperature to 325 or 350 degrees Fahrenheit. A 12-pound bird will need about 3 hours total baking time. About every 30 minutes to 1 hour, I pull it out of the oven and brush more oil on the skin. Towards the end of the baking time, check the internal temperature by inserting a meat thermometer into the deepest part of the thigh. Look for 170 degrees Fahrenheit, or just below. Once it reaches this temperature, remove the roaster pan lid and set oven to broil. Let exposed skin brown. If you can maneuver the turkey, flip to brown the breast skin under the broiler, too. Remove from oven. Let sit on the counter for about 15 minutes before carving. To carve, cut off the thigh/drumsticks and wings, and lay them flat in a glass dish. Ladle the drippings from the roaster pan over them until fully covered, then cover the dish. Then, slide the carving knife under the breast meat to carefully remove each half breast from the bones. Move each half breast to a cutting board and slice into strips against the grain of the muscle. Transfer pieces to glass dish and cover with more drippings. Then pour the rest of the drippings into a pot on the stove over medium heat. In a small cup, whisk arrowroot powder into water. Then add to drippings in pot while stirring. Keep stirring until mixture reaches a simmer and thickens. Finally, remove from heat and serve with your perfectly moist turkey! Happy Thanksgiving! How do you make your turkey? Wardee, my favorite way to cook the stuffing is inside the bird!! 🙁 It has more flavor that way, but I want to try your way of cooking the bird, so how do you cook your stuffing, if you make stuffing, so that it is not dry? Happy Thanksgiving! God Bless you and your family, too! Jean, I make stuffing in bread loaf or casserole pans. Use broth for the liquid and it will taste just like it was cooked in the turkey. I’m sorry I didn’t see your comment until just now. Somehow, email notification isn’t working so I didn’t know about your comment until today (Saturday). Wardee,you said that you put the cover on and transfer the pan to the oven. What kind of pan are you using? My roasting pan doesn’t have a cover. Is foil cover good enough for this method? Thank you. Elena – My roasting pan has a lid. I think you should use foil instead – though I hate to say it because of the aluminum. But, if you have unbleached parchment paper, put a sheet of that over the turkey, then the foil, so the foil doesn’t touch the turkey. The main goal is to seal in moisture, so yes, the turkey should be covered in some fashion. Enjoy! I always follow my Joy of Cooking instructions and use a butter soaked cloth to protect the breast. I may try upside down sometime. I always cook all poultry breast-down! No point in having crispy skin on the breast if the meat itself is dry and unappetizing. I also don’t have a roasting pan, so I cook the turkey in a deep Pyrex dish. The breast sits in the drippings the whole time, and ends up perfect every time. This is the way my GRANDMOTHER roasted poultry! I didn’t know there was another way until adulthood! I’ve had my crockpot with perpetual stock going all week from two chickens. I keep skimming some off and saving it and then adding more water to the crockpot. I’ll be trying your method this Thanksgiving. Thanks, as always, for the great tips. Thank you so much for posting this! I followed your directions to the letter (although I opted not to mess with brining this year) and my turkey turned out perfect!!!! Thank you so much! I tried this technique for my Christmas bird after seeing it done on foodnetwork. LET ME TELL YOU…..i let it rest for 30 minutes after flipping it breast side up at last 30 of bake time….oh my god in heaven!!!! Ive never had a slice of turkey that layed on my plate in its own juice. Tender(no knife needed) and juicy. I will always roast upside down. Who knew? Thank you so much for sending this recipe. In past years We have had Butterball, but after learning of all the “junk” that is in a processed chicken we opted to get an organic turkey. Once I had a fresh chicken ( it wasn’t organic) and when we cooked it it tasted terrible, all dried out with no taste. So, I was afraid that this was going to be a repeat this year. That is until your wonderful recipe arrived. We will definitely try your recipe. We also have much to be thankful to God for. God is good…all the time!! Do you have a recipe you can recommend for making the gravy from the turkey drippings? I turn my oven into a slowcooker. I cook it for an hr at 450 to kill all outside bacteria and then turn down oven to 200 to cook for hours and hours. We eat at lunch time on turkey day!